Hosting the ninth annual Empowering Women in Business Conference, the Institute for Women’s Leadership is proud to announce our two student interns who will help coordinate, market, network, and manage the event. The Empowering Women in Business Conference invites women leaders from the local community and our Nichols network to gain inspiration from our diverse series of presenters and keynote speaker. The conference offers a collection of sessions and networking opportunities designed by business leaders, educators, and Nichols students to provide attendees the opportunity to enhance their own business skills, individual growth, and career focus. The student internship is a great opportunity for two Nichols students to bring their marketing skills, ideas, and leadership abilities to life. The interns are given the opportunity to design their own marketing and promotion plan, build the networking outreach opportunities, and recruit, assign, and supervise the mass number of volunteers needed for the conference to be a continued success. 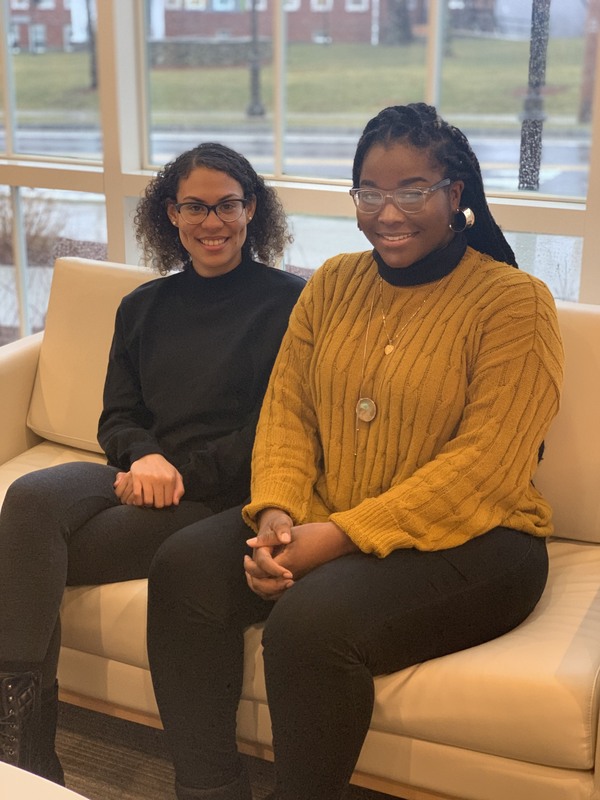 The interns for the 2019 Empowering Women in Business Conference are Sachelle Mercado ’20 and Lynn Thibault ’20. 2019 EWIB Interns Sachelle Mercado and Lynn Thibault. Originally from Port-au-Prince, Haiti, Lynn Thibault is a majoring in Marketing at Nichols, and joins the team as the marketing intern for this year’s conference. Lynn is currently a Student Ambassador for the Office of Admissions, a Peer Mentor in the NEXT Student Support Program, and a Panel Member of the Institute for Women’s Leadership. This year’s conference takes place on Thursday, April 4, 2019 from 12:45- 6pm. Not only does the event provide great opportunities to hear from successful business leaders, but attendees will also have time to shop with local vendors and network. The Institute for Women’s Leadership and the Conference Committee is also excited to announce that this year’s Keynote Speaker is Mary Carlomagno, a best-selling author, organizer, and spokesperson specializing in helping individuals embrace simplicity and organize their everyday lives to better achieve balance and live stress free. For more information or to purchase tickets to the conference visit http://www.empowering-women.biz/ or contact Rachel Ferreira at Rachel.ferreira@nichols.edu.